In Hakkoryu, no work of writing, film, video, observation in a dojo, or other form of indirect instruction can ever convey proper thinking and technique. There has never been a substitute for the transmission of Hakkoryu directly from the Soke or qualified Shihan. This is why Hakkoryu has not made its internal scrolls, books, and other manuscripts available to the public, nor has it made “training films.” One must experience and feel the teachings of Hakkoryu in order understand and make progress. That being understood, this brief introduction to Hakkoryu Waza (techniques) will attempt to convey some of the ideas and approaches used in teaching Hakkoryu at Hombu Dojo and Hakkoryu Shibu (branches). In general, Hakkoryu Jujutsu practitioners endeavor to prevent acts of violence before they occur. This is a primary belief in Hakkoryu. We say, “Idomazu” or “no challenge” which includes this idea. The first set of instruction in Hakkoryu is proper Rei. While the physical form consists of instruction in correct etiquette in a dojo and other Japanese settings, the principle must be more fully explained by Hakkoryu Shihan. Such explanation should discuss the importance of respecting others. Its form might manifest itself in acts of politeness, courtesy, empathy, flexibility, and simply enough, smiling. Thinking and acting in such a manner towards others may be the best and simplest form of self-protection available. After this first Hakkoryu lesson, probably ninety-five percent of situations that lead to violent actions can be prevented. The rest of Hakkoryu is for use where such an approach is not practical or proves ineffective. The very first basic technique in the Hakkoryu Shodan Kata is named “Hakko Dori.” One of the lessons it contains is the principle on how to escape. Should an attack be imminent or occurring, this art teaches methods to neutralize, avoid, or escape from strikes, grabs, and other types of physical dilemmas. In the dojo, physical techniques of escape are taught, but the principle may be expanded to everyday common sense actions such as just crossing the street if you see trouble ahead. Another early basic technique in the Shodan-gi teaches Hakkoryu Atemi (addressed below). During an initial attack by Kake (the attacker), these two are often combined. It has been rare to find a practical bugei/budo system where striking does not play a very significant role. It can be said that most Hakkoryu physical techniques start with striking and escape, though not necessarily in that order. What to do then? Subsequent Hakkoryu techniques usually involve Osae (arresting) or Nage/Otoshi (throwing/dropping) techniques. These may utilize Keiraku, Katame (joint locks), and/or methods of Kuzushi (off-balancing). Throughout Hakkoryu, the idea of abandoning force is emphasized. In the study of “Inyodo” (the way of yin and yang) one comes to see that an excess of either is detrimental. In Hakkoryu Jujutsu we say, “Sakarawazu” or “no resistance” in order to teach mental and physical relaxation/settling and to not fight against Kake’s force. Avoid where Kake is strong. Focus where Kake is weak. As described in the History section of this website, Hakkoryu combines traditional medical thinking with arts of self-preservation. This is best exemplified when feeling the Atemi (strikes to the body) and Osae (arresting) techniques of Hakkoryu. Many of these are directed at Tsubo (special points) located along Keiraku (meridians) of the body. They can cause very sharp and distracting pain without necessarily injuring Kake. In Hakkoryu we say, “Kizu Tsukezu” or “no injury” to emphasize our hope that injury to Kake can be avoided. Only when it is unavoidable does Hakkoryu direct its Atemi to Kyusho (vital points). Hakkoryu Kata and techniques build on each other one-by-one. Each Kata (Shodan, Nidan, Sandan, etc.) 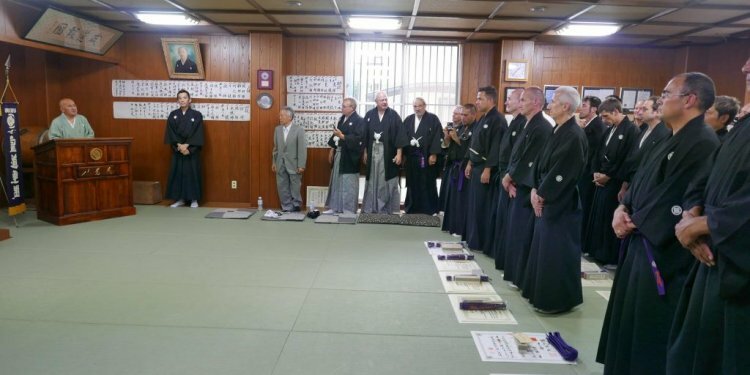 begin with techniques in Seiza (formal Japanese sitting) then advance to standing arts. With Hakkoryu’s direct Shihan-to-Deshi teaching style, the correct ways to perform techniques can be clearly shown, corrections can be made quickly, and bad habits avoided. The Kata of Hakkoryu contain the wisdom and lessons passed down directly to us by Shodai Soke Okuyama Ryuho. As with all Japanese bugei/budo Kata, they may be considered “ideal models for teaching.” In Hakkoryu, their purpose is to clearly teach our principles (Gensoku), not to provide the best solution for any given self-defense situation. Once the Kata are mastered and our principles understood, they may be adapted for use in myriad practical situations. practice everyday, their feeling for the sound becomes sharper and sharper. Progress cannot be rushed. It depends on the abilities and determination of the Deshi. Step by step, the techniques of Hakkoryu become more advanced, powerful, and in combination, sometimes complicated. It is Hakkoryu’s purpose to eventually elevate a Deshi’s skill to the point where he/she will be able to create their own principle-based actions for use in practical self-defense situations. This is when the Deshi stops imitating and takes on Hakkoryu techniques as though their own.